Hello everyone! This is the first development diary on China: Mao's legacy. If you would like this format, we will continue to write such diaries. The idea of a next project was born during the Ostalgie development. First we were thinking about small and not influential contries such as Chile, Egypt and Ethopia in the 70-s, but eventually we (and you too - we often saw comments with requests about making a game about China) considered China a more interesting subject. That brought us new questions. China is not a regional country - it's a large country with powerful army, developed intelligence and geopolitical ambitions. Also we needed a new factor, that would have made game more difficult, propelled the gamer to specific actions and taken his attention. In Crisis it the Kremlin such factor were accumulated problems in the country and hurtful USA, in the Ostalgie they were collapsing socialist camp and destructive Gorbachev. In this game we will try to make geopolitical struggle and China's (which wasn't even properly industrialized by 1976) development that factor. The game will try to put you in China's real historical position - geopolitical situation will provoke conflicts with the USSR and reformers paths will offer the quiclest and easiest ways of economic growth (but are they the best ones?..). We also refined the system of doctrines to return CiK clearness to it and save Ostalgie's easiness. 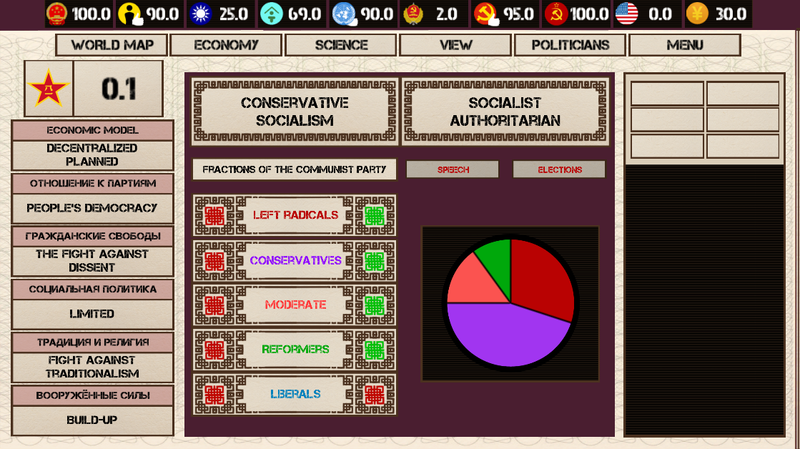 Of course we will also introduce new mechanics, such as more complicated interaction with politicians, who would conspire and promote their ideas. Chinese politics is a bunch of sneaky cats with all colors, not only black and white. Of course this is not all the new elements that we will introduce, and we will continue to tell you about them in our next diaries.